I painted the bridge paper-thin and fragile because that’s how it appears, even though it isn’t. According to the literature around the canyon, if one wanted to rest a fully-loaded Boeing 747 on it, the bridge would hold up. It is a lot stronger than it looks. This painting was done to illustrate a particular spot, which is where marriage was proposed and accepted, there, on the lower left-hand platform surrounded by leaning trees. The proposal spot is positioned so light from a left-hand source in its intended hanging spot will illuminate it. 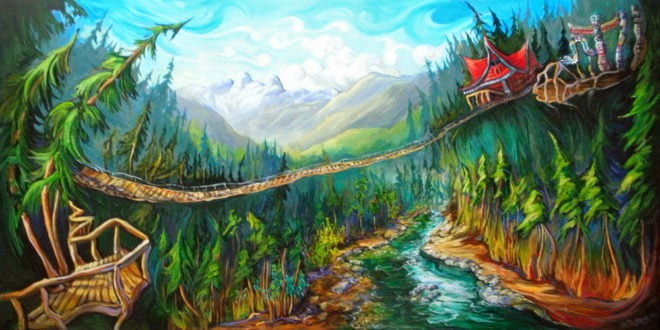 The scene captures the suspension bridge and the surrounding area, not just in detail but spirit: so the trees lean and bend, the water seems closer than it really is, and there are mountains that you can’t really see from that vantage point but you know they are there. The Lions are a pair of pointed granite peaks in the North Shore mountain range. You can’t see the Lions from this particular Capilano vantage point-the forest is dense-but if you’re in North Vancouver, you feel them. Even when they are out of your view for a moment, you will see them again soon enough. The Lions symbolize pairs, twins, and couplings: after all, you never see one without the other. The Capilano Suspension bridge scene is an apt metaphor for the starting-out point of a marriage proposal. The path inwards, along the riverbank, leads to the twosomeness of the Lions mountains. The bridge is an implied journey from one part to another, not just start to finish, but also back again. There is risk and euphoria all mixed at the start and a thrill as one crosses over.